ML is beginning to deliver on the potential created by big data and analytics by turning raw data into useful, predictive tools for business. Innovation-minded business leaders are embracing ML as “the next big thing” and have already crafted ML strategies and initiatives that promise real benefits and return on investment (ROI). 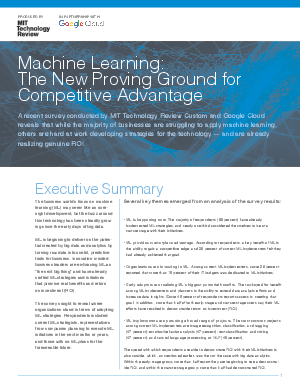 The survey sought to reveal where organizations stand in terms of adopting ML strategies. Respondents included current ML strategists, representatives from companies planning to execute ML initiatives in the next months or years, and those with no ML plans for the foreseeable future.